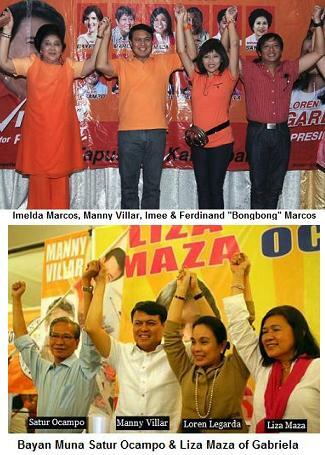 The bitter enemies of the late President Ferdinand Marcos are now the political allies of his son, Ilocos Norte Rep. Ferdinand Marcos Jr., who is running for a senator under the Nacionalista Party. Marcos, 53, yesterday said he will campaign for his fellow NP senatorial candidates, militant party-list Rep. Satur Ocampo of Bayan Muna and Gabriela Women's Party-list Rep. Liza Maza, in the Ilocos region, which used to be described as the “Solid North”, a bailiwick of the Marcoses. The younger Marcos is the son and namesake of the late dictator Ferdinand Marcos, who jailed Ocampo and other political activists, including the late Senator Benigno Aquino Jr. during Martial Law. “We will be carrying every candidate of NP because I am part of the ticket. If I will not do it, then I should run under the NP, Marcos said, in a press conference in Talisay City, Negros Occidental. In previous media interviews, Ocampo said he and Maza had not decided to support any other senatorial candidates of the NP. “As of now we are not saying anything beyond this announcement of mutual adoption,” Ocampo said, although he stressed that he was willing to talk to the other candidates to work out common causes. Marcos assured his full support to all national and local candidates of the NP. “Whatever help I can offer to them, I will do it,” he added. Marcos said their differences with Ocampo and other political activists obviously started in ideology. Ocampo had gone underground during the Martial Law days and served as the spokesman of the National Democratic Front. Marcos also assured overwhelming votes from what he calls “Solid Ilocandia” to NP presidential candidate Manny Villar and the senatorial candidates running under him. Accompanied by his Negrense wife, Louise, and two sons, Simon and Sandro, Marcos said he expects from Negrosanons the same support they got from other places across the nation. “Their reactions to us have been gratifying because we have delivered a message to fight and solve the problems, talked and presented our platforms of government and advocacies” he added. Louise Araneta-Marcos whose family resides in Bago City, Negros Occidental, appealed to her fellow Negrosanons to vote for her husband. Asked if he has plans to run for president in the near future, Marcos replied “I don’t know”. He, however, added “What I am thinking right now is how to win in this May elections as a senator”.